This lovely canvas is by one of our artists Sharon Hendy-Moman. 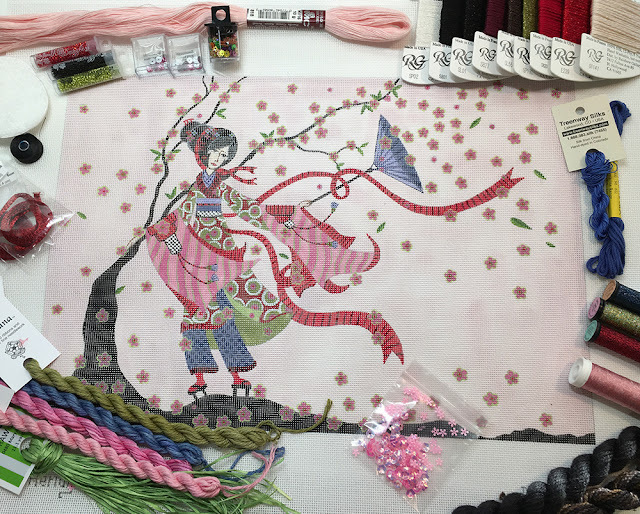 She paints Asian women in beautiful flowing kimonos and we translate them into needlepoint. One of the lucky ladies in my embellishment class this weekend will be stitching this beauty. Look at all the goodies we have ready for this canvas. I can’t wait for Peggy to start stitching. If you would like to stitch your own Wind Whipped My Kimono, give us a call at 410.296.0405 or order on-line here. We’ll do the rest.